Pound-for-pound ace Gennady Golovkin believes his unification world title clash with fellow hard-hitter David Lemieux will rank alongside some of the middleweight divisions best ever. The Kazakh assassin will put his WBA and IBO world titles on the line in a 160-pound meeting with Canada’s IBF champion Lemieux this Saturday night at the iconic Madison Square Garden, live and exclusive on BoxNation. The showdown pits together two of the world’s biggest punchers, who average a near 90% knockout ratio between them, with the electrifying Golovkin saying that the clash will be an all-action affair to follow the great battles of the past. “This is a true fight, an original fight. It’s going to be a present for people. Boxing isn’t a game; it’s very important who the true number one is. 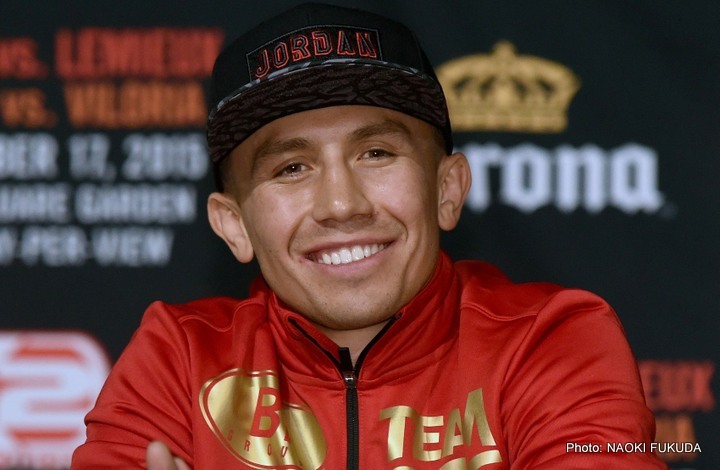 This is my big test and my first step to history and to a new story,” said Golovkin. “This is my first unification fight and my first pay-per-view fight. It’s about being a true warrior and not just a business man. I love to fight, it’s that simple. I’m looking to knock him out. “I’m more motivated than ever because it’s a unification fight and a pay-per-view. I keep saying it’s an ‘old school’ fight because this will be a classic fight. “It’s like a long time ago when Marvin Hagler, Tommy Hearns and Sugar Ray Leonard all fought; it will be in this same style,” he said. The 33-year-old has waited a while for his big break and now in front of a sold out 15,000 arena at New York’s legendary Madison Square Garden he is ready to grab his chance to prove himself against a formidable champion in Lemieux. “I know I’m 33 years old but I feel like I’m 22 years old. I didn’t feel any pressure to get these big fights but I know every step is bigger and I know Lemieux is a strong guy, a dangerous guy. Everyone knows my style and it’s a very interesting fight for the fans and for television. “Madison Square Garden is my second home. It’s very important and special that the fight is sold out. People in the United States understand my style and that’s amazing for me. “I really appreciate the support of the fans. Madison Square Garden is a very special place with a great history so it’s an honour to fight in front of these fans,” Golovkin said. The middleweight division is brimming with talent, with a host of title fights lined up to prove who the undisputed number one is in the division. Next month WBC champion Miguel Cotto defends his belt against Mexican icon Canelo Alvarez, with Ireland’s Andy Lee putting his WBO strap up for grabs against the undefeated Billy Joe Saunders, plus Peter Quillin faces American Danny Jacobs. An intriguing time looms over the 160-pound weight class with Golovkin eager to take on all comers. “It’s a very interesting first step for me and Lemieux to see who goes onto the next step to prove who the best in the middleweight division is,” said Golovkin. “There are three or four top pay-per-view fighters – we’re all in the same situation. Maybe the next step for me will be the winner of Cotto or Canelo, Andy Lee or Saunders, or Jacobs and Quillin. It’s a very interesting situation and this is only the first step,” he said. This weekend’s thrilling card will also see another of boxing’s most talented fighters in action when Roman ‘Chocolatito’ Gonzalez will look to make it 44-wins unbeaten when he defends his WBC flyweight title against the tough Brian Viloria. Golovkin v Lemieux is exclusively live on BoxNation (Sky 437/490HD, Virgin 546, TalkTalk 415, online and app) this Saturday night. Visit boxnation.com to subscribe. Thrilling middleweight champion Gennady Golovkin has admitted that he faces his toughest test to date this Saturday night. The potential heir to Floyd Mayweather’s mythical pound-for-pound throne has taken the boxing world by storm over the last year by blitzing his way to the very top of the 160-pound division.